Internment services were held for 9 members of the B-29, Haley's Comet, on May 10, 1949 at the Zachary Taylor National Cemetery Section E 62. The B-29, Haley's Comet, A22, 42-24616, was assigned to the 870th Squadron, 497th Bomb Group, 73rd Wing on Saipan. The B-29, “Haley’s Comet”, took off from Saipan to bomb the Nakajima Aircraft Factory in Musashino, a western suburb of Tokyo. Poor weather, intense flak and fighters attack the formation. This B-29 was hit by flak and fighters and fell behind in the formation with its bomb bay on fire. It was continually attacked by fighters until “Haleys Comet” was rammed by a Japanese fighter. The B-29 crashed Ishino, Shisui Town, Inba County, Chiba Prefecture. Lt Carpenter and Sgt Lodovici parachuted, were captured and survived the Omori POW Camp. This B-29 Superfortress, 42-63513, “Ramp Queen,” and crew were assigned to the 877th Squadron of the 499th Bomb Group. On May 26, 1945, while participating in one of the largest bombing missions over Tokyo, in the moonlight, the aircraft was shot down off the coast of Nara by a Japanese fighter stationed at Yokosuka Naval Base. On October 24, 1949 six crewmembers were buried in Section E Site 190-191 at the Zachary Taylor National Cemetery. The Radio Operator, Sgt Paul H. Norris was buried at Site 192 on the same day. Japanese reporting indicates that Cpl Forystek and Sgt Olson were taken to the military Police Headquarters both having burns. Cpl Forystek died on May 27, 1945 and Sgt Olson on June 5, 1945 by suicide with poison shortly after interrogation by the military police commander in a medical treatment room of the GHQ Criminal Affairs Bureau. Near the end of June eight unidentified bodies washed ashore near the crash site and were buried at the scene. This B-29 Superfortress, 42-65327, “Princess Eileen IV,” and crew were assigned to the 678th Squadron of the 444th Bomb Group. On May 25, 1945 the aircraft crashed near Mt. Yamane Toyosato village with the target for the mission being Tokyo City. On October 24, 1949 two members of the crew, Sgt Pittaro and Sgt Bickell, were buried with the crew of “Ramp Queen” in Section E Plot 190-191 at the Zachary Taylor National Cemetery. Japanese records indicate Lt. Streink, Lt. Newcomb, Lt. Orzilli, Sgt Bloodgood and Lt. McEachern were taken to the military police headquarters. S/Sgt Press fled the scene up in the mountains. However on June 10 two women identified him to the military police. The B-29, 42-24766, "Leading Lady", assigned to the 882nd Squadron, 500th Bomb Group, 73rd Wing , was lost on January 3, 1945. The crew was buried on August 13, 1949 in Section E 114 at the Zachary Taylor National Cemetery. Fifty seven of ninety seven 73rd BW B-29's dispatched to bomb port facilities and urban areas of Nagoya with incendiary bombs; and 21 attack alternate targets. Japanese fighters fly 300+ attacks on the bombers and 5 B-29's are lost. Gunners claim 14-14-20 Japanese aircraft. SgtThomas H. Hedges – POW – He was moved to Osaka Kempei Tai Headquarters, then to Tokyo Kempei and imprisoned in Omori POW Camp. "We slid out of formation and fell 5,000 feet. We leveled out for just a second, the right side exploded and the aircraft rolled over on her it's back and went into a spin. Just as it rolled over it threw me out of my escape hatch. I opened my chute right after I went out and I was watching the ship spin down. Two Japanese fighters came in strafing me and I lost sight of the ship. That was the last time I saw it or the crew." Japanese sources say "it was probably the result of an accidental collision rather then an intentional ramming." After the Nagoya city bombing which becomes first anti- urban district incendiary bomb air raid, 15:14 around flying Tsubame of the resident in Komaki army 55th squadron (Daita actual lieutenant junior grade operation) direct attack against the third engine and between the nose. To become operation impossible, the Aichi prefecture east Kamo Gun Matsudaira village fascine [me] (reality: Aichi prefecture Toyota checks flat fascine [me]) fall. Daita lieutenant junior grade death in battle. The only survivorAs for HEDGES sergeant 4 day restraint, Okazaki military policeman amount place, Toyohashi military policeman squad, by way of the Nagoya military policeman party, in the Nagoya division headquarters sending 致. From middle of January Nagoya in resident in Osaka center Army Headquarters sending 致. In the Osaka army jail commitment. By the March 1st defense General Headquarters indication, accommodation to main place of Tokyo 俘虜 internment camp. The B-29, Z Square 7, 42-63486, was assigned to the 881st Squadron, 500th Bomb Group, 73rd Wing. They were shot down in Tokyo Bay on May 24, 1945 with one survivor. The crew was buried October 4, 1949 in Section E 179 at the Zachary Taylor National Cemetery. Shortly after 4AM and releasing their bombs on the target, the plane was hit with flak on the right wing. Unable to extinguish the fire they were going to the rescue submarine when the plane was hit with flak again in the rear that destroyed all the controls including the intercom. Lt Thomas, Lt. Glacken and S/Sgt Sam Bradford parachuted from the front hatch. It is believed T/Sgt Mitchell and Lt Bassett parachuted from the open bomb bay. Lt Phillips was the last man to leave the front of the plane and the only survivor. Just seconds after he parachuted the plane exploded in mid-air and fell into Tokyo Bay burning. It stayed on top of the water for about 10 minutes before slipping beneath the waves of Tokyo Bay. The status of the crewmen in the rear of the plane is unknown due to the loss of the intercom. The B-29 “In The Mood” 42-24826, assigned to the 483rd Squadron, 505th Bomb Group, was shot down on May 26, 1945 and most of the crew was buried in Section E 20, Zachary Taylor National Cemetery on February 11, 1949. They were held at the USAF Mausoleum-Yokohama No. 1 until interred in their final resting place at the National Cemetery in Louisville, Ky.
1st Lt Francis F Jensen Jr of the B-29 "In the Mood"
He was captured and had suffered burns. The Japanese doctor poisoned him with Potassium Cyanide on 28 June 1945 at the Omori POW Camp. His remains are at the Honolulu Cemetery, "P-0-526". "Another mission, and it was a good one. Didn't see much at all except a bunch of searchlights and a lot of fires. Tokyo just isn't what it used to be although quite a few of the guys were shot up." "Back to Tokyo again. It certainly was different from the night before. Don't know if they found out we were coming or what but they certainly were ready. They really were pouring up the old fire at us. It's been three or four missions since we've seen any like it. It looked like a solid sheet when we started in. I'm telling you, Ma, everyone in that plane was scared. Sounds as though we had switched dates! But both missions turned out pretty bad for a lot of the crews." (Mission 183) During the night of 25-26 May, 464 B-29's dispatched from the XXI BC attack Tokyo urban areas immediately south of the Imperial Palace and just north of that bombed on 23-24 May with 3262 tons of incendiary bombs which destroyed financial, commercial and governmental districts as well as factories and homes; six B-29's attack other targets. The AAF claims 19 Japanese fighters. Twenty-six B-29's are lost (the largest loss of B-29's and crews in a single day). In Tokyo urban district air raid where becomes 23rd combat mission, alternating with the original left crew, Jensen lieutenant junior grade of 505th bombardment group gunnery officer embarking, In the Mood which participated received anti-aircraft shell 2 shot direct bomb hits, the Saitama prefecture Kawaguchi city good fortune 藏 fell in the Nitta rice field. 6 corpses who exclude 5 people who succeed in parachute escaping were collected from actual place, Kawaguchi city in dense 藏 institute of the line field were cremated were enshrined cheaply. This B-29 Superfortress, 42-24828, “Lil Spook,” and crew were assigned to the 484th Squadron of the 505th Bomb Group. On May 26, 1945, the aircraft was lost over Tokyo while participating in one of the largest air operations in the history of the world. Japanese records indicate that the crewmen were buried in the Koishikawa Army Cemetery after removal from the wreckage. Eleven of the twelve crewmen were buried in Section E Site 175-177 on October 13, 1949 at the Zachary Taylor National Cemetery. Sgt McQuade, William J, Right Gunner . This B-26, Marauder, crashed in Brazil enroute to the war in Europe. The plane and crew were probably assigned to the 320th Bomb Group. They were buried on May 6, 1948 in Section E 1 at the Zachary Taylor Nat’l Cemetery. 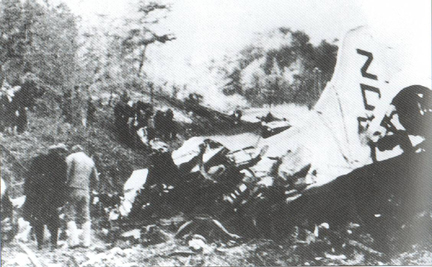 On an overcast afternoon in January 1945, the B-26 crashed on Vakayri Mountain near Belem.